Many career Marines take advantage of their off-duty time to work on a college degree, rather than wait until they retire to become full-time adult learners. 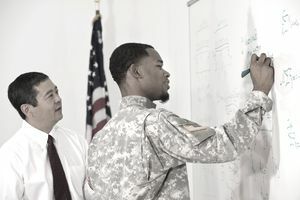 In addition to reflecting well upon your qualifications for promotion within the Corps, this is a great strategy to make yourself marketable in the highly competitive civilian job market. It can be a tough road to follow, though, taking years to accumulate enough credits for a bachelor's degree and essentially eating up all of your free time. It may also be virtually impossible if you're in a demanding assignment with unruly hours, such as infantry, recruiting, or drill instructor. The SNCO Degree Completion Program (SNCODCP) fortunately offers its staff noncommissioned officers (SNCOs) -- Marines of paygrade E-6 and above -- an incentive to finish a four-year degree without struggling to squeeze class in after hours. Potential dealbreaker: SNCODCP doesn't pay for your degree. Though Marines may still use GI Bill benefits and loans, in a day and age when sequestration has killed off the Marines' Tuition Assistance Program, I wouldn't hold it against you for thinking, "What's the point, then?" And as a program designed to benefit the Marine Corps as much as the individual Marine, SNCODCP pairs students' degree programs with assignments outside their military occupational specialty (MOS). These assignments are unusually unique resume-builders for the promotion- (or civilian career-) minded Marine, and offer another opportunity to refresh your military career. But more on these assignments later. The name of the program naturally implies that Marines ranked sergeant and below aren't eligible. Becoming a staff sergeant in the Corps is the guaranteed signifier that as long as you don't screw up, you're going to be able to reach at least 20 years and retire with pay and benefits. And the SNCODCP is all about investing in the education of Marines who want to stay on to become master gunnery sergeants or sergeants major (E-9). Unfortunately, getting into SNCODCP requires some time struggling through off-duty education, unless you've been through a few years of college before enlisting. Once you've achieved an associate's degree or 60 semester hours of school (at least a third of it fulfilled by classroom work, not test or military credit) then you're ready to start looking at the Corps' yearly SNCODCP bulletin and start putting together your application. The Marine Corps announces application season for SNCODCP each year by administrative message (MARADMIN) on its website. In addition to setting deadlines, these MARADMINs describe which college degree programs will be eligible for entry. You heard that right: The Marine Corps will not let you take time off from your duties to earn a degree in underwater basket weaving just because it's your life's passion. They are irritatingly specific about which degrees they think will actually benefit the Marine Corps in the long run. As of 2013, the focus for SNCODCP seems to be staff NCOs pursuing a degree in "environmental safety, environmental health management, occupational safety, safety management, waste management, or hazardous material and waste control," as well as education and paralegal. According to Marine Corps Order 1560.21D (PDF file) -- originally published in 1999 to describe SNCODCP requirements -- there are sometimes opportunities to study criminal justice, psychology, or computer science as well, though these seem to be off the table as of 2013. If you notice an emphasis on safety in the list of eligible degrees above, it's because many in the SNCODCP may be assigned after graduation as ground safety specialists. But this is just one of several possible assignments for SNCODCP graduates, who receive additional MOS 8015, College-Degree Enlisted, once they've finished school. According to the Marine Corps MOS Manual (PDF file),​ a SNCODCP graduate may also take on key roles within "SNCOA [Staff NCO Academy], or other large formal schools," or as "Education Chief/Testing NCOIC [NCO-in-charge] . . . Accounting Analyst, or NCOIC/Counselor at [a] Family Service Center at USMC bases/stations."